The boys tennis team members share their goals and reflect on their high school tennis careers. 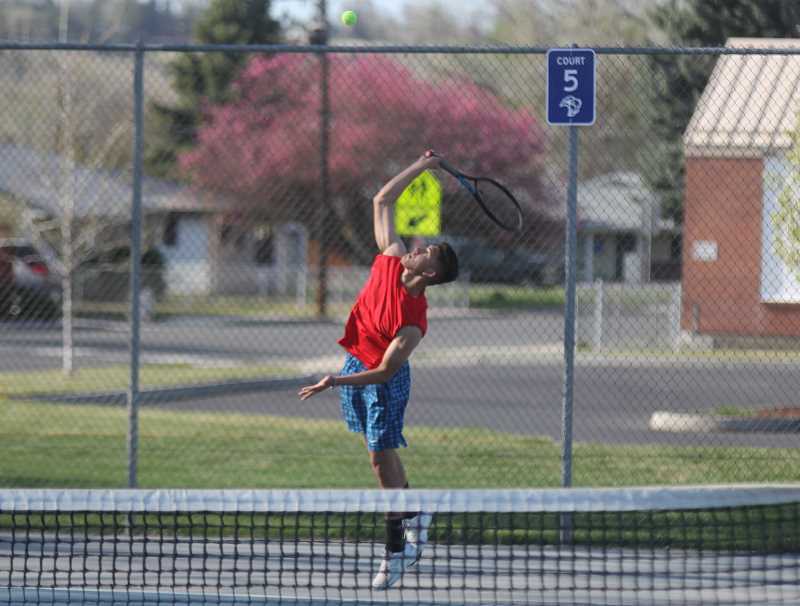 Madras boys tennis beat Cascade, 11-8 in sets, tied 4-4 in matches, in their last home meet, Thursday, April 26. Jose Piceno, of Madras, beat Cameron Jeppson in two close sets, 7-5, 6-4 in the No. 2 singles match. In the No. 4 singles match, Killian Smith beat Justin Torres in two sets 6-2, 6-2. On the doubles side, Tony Giron and Esteban Gomez beat Easton Crut and Eric Mitchell. They won in two sets, 6-3, 6-2 in the No. 1 doubles match. In the No. 4 doubles tennis match, Roberto Garcia and Sebastian Norato beat Erik Michaelson and Spencer Howles in two sets, 6-2, 6-1. The meet was the last home meet for seniors Brandon Salgado and Oliver Fisk. Salgado is the No. 1 singles player for Madras and Fisk is partners with Kobey Jorgenson in the No. 2 doubles spot. "I feel good about things; I am still working on a few things to get better," said Salgado. "My goals are to experience more and to keep getting better. I am still learning every game, trying to take everything slow. I am trying to get consistency to my game." "I have had a good season; all my teammates have been really fun to play with," he added. "I am glad I could help this program out as much as I could." "This is surreal; it is the last time I will ever play on this court, the last time my family will ever watch me play here," said Fisk. "I think this team has done great things, especially all the seniors that moved on from last year," said Fisk. "It will be awesome to see how all the kids do next year. My goals are to do good in districts, hopefully place high and be able to go to state." The boys tennis team traveled to Molalla April 24, and lost 5-3. The only player to win a singles match from Madras was Brandon Salgado, who won the No. 1 match in three close sets, 6-7, 6-4, 6-3, beating Logan Child. On the doubles side, Madras managed to win two matches on Tuesday. Esteban Gomez and Tony Giron beat Ricky Oteros and Nathan Pederson in the No. 1 doubles match. They won in two sets, 6-4, 6-4. The No. 4 doubles match was won by Sebastian Norato and Roberto Garcia, of Madras who won in two sets, 7-5, 6-4, against Nick Viol and Teo Sjoestrand.